This weekend Henley Rowing Club represented GB abroad whilst the rest of the club continued to win at home at the Henley Town & Visitors Regatta. 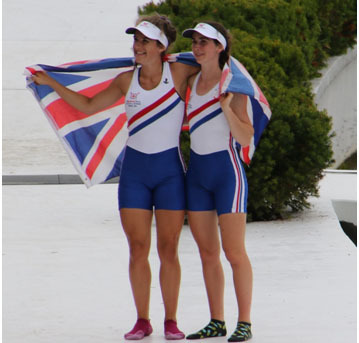 Following a selection process that began last October, including numerous camps ergo tests and culminating in 5 days of intense seat racing in early July, Henley Rowing Clubs’ junior girls Lauren Kay and Lottie Orr were selected to represent Great Britain at the prestigious Coupe de la Jeunesse. Twelve European countries compete at the Coupe, which not only presents medals for winning crews, but is also a team event with medals for the best boys & girls teams. This year the event was held on the very impressive Lake Malta course in Poznan, Poland, which has been host to just about every major rowing championship. The Great Britain team travelled out on Tuesday for three days of camp and acclimatisation before racing Friday, Saturday and Sunday. The event opened on Friday with the Girls 8o race, where Lauren Kay was in the winning GB boat with convincing wins over Italy and the Netherlands for the first Gold medal of the Championships. 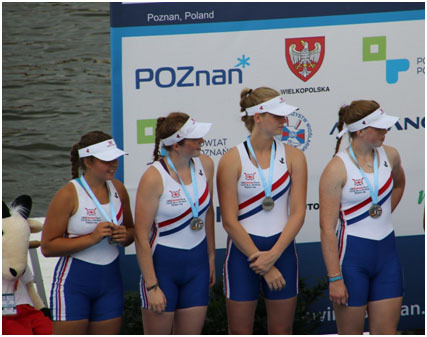 On Saturday and Sunday Lauren stroked the girls coxless four. Saturday saw a photo finish for Bronze and Silver place with the photo showing GB just missing out on silver to the Dutch and Spain taking the Gold. On Sunday the four pulled back from third to close on leaders Spain in the last 500m but couldn’t quite get the Gold, but a very convincing Silver. Lottie Orr competed in the double sculls with Danielle Semple from Headington. On both days in heats and finals, this crew never looked as though it was going to be caught. 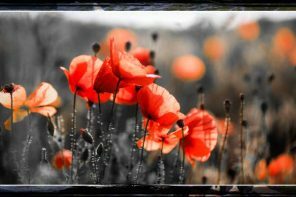 They set off, established a lead and just built on it. In Sunday’s final with 500m to go, they were 7 secs clear of second place Switzerland and were able to enjoy the applause of the crowd at their first international competition. Great Britain walked away from the event with 15 Gold Medals, 7 silver and 2 Bronze and convincing winners of the overall event and both Boys and Girls team prizes. 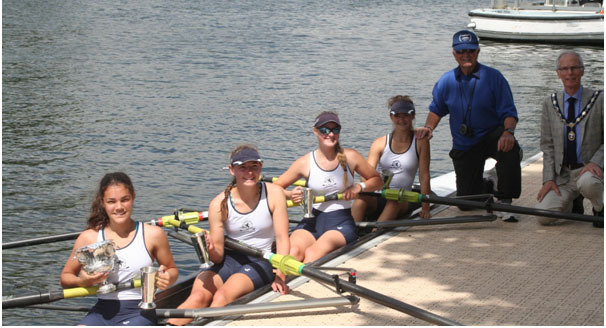 Bruce Turnell had a memorable win in J16 1x. In his semi – final he overcame a strong Maidenhead sculler, who had recently represented Great Britain. He established an early lead, and fought off repeated challenges to win a very quick and exciting race by 1/3 length. Bruce’s winning time was one of the fastest of the day for 1x events, equalling the winning time for men’s IM3 1x and being faster than for mens’ IM2 1x. His final was more comfortable, coming home a length up on his nearest rival in a three boat race. 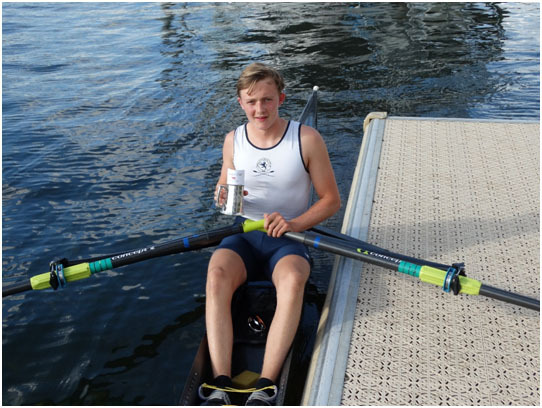 There were also convincing wins for the J14 single, Grant Taylor, and J14 double of Euan Turnell and James Swinburn whom both beat rowers from Stratford-upon-Avon BC easily. 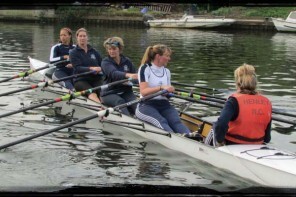 The club also won the Mixed Quads where they had two boats in the final. The winning crew were Fiona Walsh, Anna Steens, Miriam Brahm, Philip Kiely and cox Sam Agass. 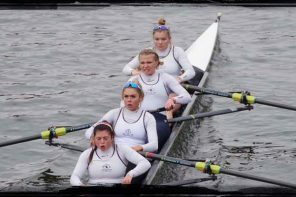 There was also a fantastic result from one of HRC’s junior squads (with x3 J16s and a J17) whom punched above their weight to win the Women’s Elite Coxless Four. The winning crew of Rebecca Lister, Alicia Redman, Grace Johnson and Alice Jones, all of whom are still juniors, beat Fulham Reach RC by 3 lengths to take Town Challenge Cup which was presented by the Mayor of Henley, who was delighted to award it to a home team. 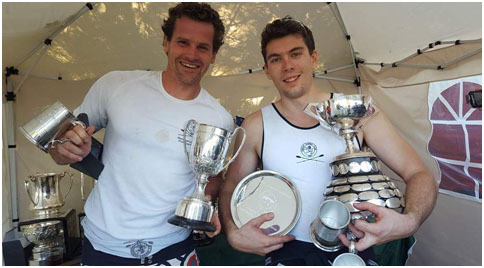 HRC’s newly appointed captain Stan Admiraal joined with fellow oarsmen Peter Charij to beat off rivals from Ardingly and Staines to win the IM1 doubles at this weekend’s Staines Regatta. Stan, a former Dutch International, has started his new captaincy off with a flying start, having won IM3 senior sculls at Molesey the weekend before – seeing off rivals from Staines, Molesey and Weybridge. Further success also followed for Peter Charij at Staines, as he went onto to win the Senior sculls against Stratford-upon Avon. HRC continues to build its senior and junior squads and Stan & Peter’s recent victories are further testament to the club’s progress in developing athletes of all ages and abilities.